The Common Krait (Bungarus caeruleus) is a highly venomous snake species found in the Indian subcontinent. These snakes are found almost all over Peninsular India but not in the offshore Islands. 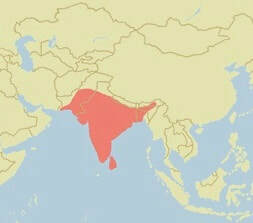 They are also found in other neighboring countries such as Pakistan, Bangladesh, Nepal, and Sri Lanka. Within their extensive range, they are found in a variety of habitat types in a wide range of elevations from lowland plains to hills at elevations as high as 1,700 meters. The common krait inhabits rainforest, scrub forest, dry, moist or mixed deciduous forest, semi-deserts with alluvial soil, wetlands, grasslands, agricultural lands or rocky terrain. Most often these type of snakes is found near water sources. But they are also found around inhabited areas and urban settlements, sometimes even entering human dwellings during the night. That's one of the reasons this member of the "big four" is responsible for most of the snake bites on humans in India. ​Usually, these snakes hide in loose soil, termite mounds, ground crevices, beneath debris, brick piles, rat holes and often found in farms and gardens but are rarely seen during the day. They are usually terrestrial but are capable of climbing well on rough surfaces in search of prey and hiding places. The Common Krait is an exclusively nocturnal species being active only from late evening to the early morning. During the day they are generally quite docile, shy and unaggressive snakes, but during the night they become very active and alert and much more aggressive. ​If disturbed it will often flatten and coil its body trying to hide its head concealing it in the middle, in a manner similar to that of the non-venomous Ball Python (Python regius). It makes some jerky movements and may also lift its tail. When a Common Krait forms this "ball" usually during the day it may allow considerable handling, however, if over handled it may eventually bite. But at night they will hiss loudly and will more readily bite. The Common Krait is a moderately slender medium-sized snake with smooth and glossy appearance. Their average length is around 3 feet (90 cm) but can grow to a maximum length of 6 ft (180 cm). Males are usually longer than females and possess proportionately longer tails. They have a cylindrical body, which tapers towards the short and rounded tail. While their head is flat and egg-shaped with a short snout and barely distinguishable from the neck, with small black eyes and round pupils. Their dorsal color varies from a bluish black, pale bluish gray, dark brown or a uniform glossy black often displaying somewhat of a blue iridescence. Combined with about 40 or 50 narrow white, yellowish, or grayish crossbands all over the body. However, these may become vertebral spots, or be indistinct maybe even absent in the forebody in older specimens. In young snakes, the crossband pattern is complete and very well defined. ​This snake is also known as Common Indian krait, Indian krait or blue krait. But this is a totally different species from the Malayan Krait (Bungarus candidus) which is also often referred to as the blue krait. There aren't any subspecies currently recognized by scientists for the Common Krait. This infamous venomous snake is not only a member of the famous "Big Four" snakes of India, it has the most potent snake venom amongst them, regarded as one of the most toxic in the world. They are responsible for the majority of snake bites on humans in India. Although they are somewhat reluctant to bite, when they do, the common Krait typically holds on to the victim for a while. This enables them to inject considerable amounts of their highly toxic venom into the victim. The venom intravenous LD50 value in mice is about 0.169 mg with an average venom yield per bite of 10 mg in dry weight. The Common Krait’s venom contains mostly powerful pre and postsynaptic neurotoxins that affect the nervous system inducing muscle paralysis. Normally the bite victims complain of severe abdominal cramps, tightening of the facial muscles and inability to see or talk combined with progressive paralysis. Death occurs due to asphyxia through respiratory failure. An untreated Common Krait bite has a mortality rate of 70 to 80%, and death can occur in as little as 4 to 5 hours after the bite. These nocturnal snakes are active at night and are seldom encountered by humans during the day so most bite incidents occur at night. Even scarier is the fact that many of their bites occur while the victim is sleeping. Since the bite is almost painless unlike that of an Indian cobra (Naja naja) or a viper, it's more like a mosquito bite, very often the victim may not even realize it was bitten. The bite victim may never wake up again and die while sleeping. This situation occurs most often during the rainy season when Common Kraits come out of their hiding places to find a dry refuge and enter inside houses at night. There are some myths surrounding the fact that kraits enter human dwellings. Some people believe they come to lick salt found in human sweat. But probably they are only seeking a warm place, like a human in a bed on the floor. This is why those who live in areas where the Common Krait is found are advised to sleep on raised beds and not on the floor. This is without a doubt the most dangerous species in the Bunguarus genus. The Common krait feeds mostly on other snakes such as the blind snakes of the genus Typhlops, wolf snakes, small cobras, and even other Kraits. However, they also feed on other animals including small rodents such as rats, and mice, lizards frogs, and toads. Sometimes younger specimens also feed on arthropods. 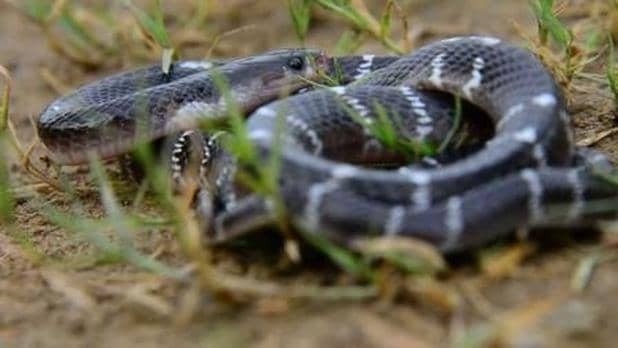 They do help to control the population of many common snakes including venomous ones and rodents near human settlements and agricultural lands. The Common Krait breeding season begins with summer this is an oviparous snake, meaning females lay eggs. Like some other snake species, male combat has been observed normally during spring and summer months. Females will lay a clutch of 8 to 12 eggs in mounds, holes, and in leaf litter from March to July. The eggs will hatch in about 60 days usually coinciding with the start of monsoon season, during the incubation period the female stays with the eggs. At birth, the hatchlings are about 25 to 27cm long and look similar to adults. The Common Krait has not yet been assessed for the IUCN Red List. The major threats to the species include indiscriminate killing due to fear of this highly venomous snake and also deforestation. They are very often victims of road kill, while in many parts of their range they are exploited for their meat and skin. Their venom regarded as medically useful is traded and high in demand and price. The Mojave rattlesnake venom is considered the most toxic of any rattlesnake species.